Last week, the comedy world brought the rest of the planet to its Titannica-loving knees with Paul F. Tompkins teasing a possible Mr. Show reunion or revival. It turns out we didn’t have to wait that long to get confirmation, as co-creator David Cross himself has made it official, both aloud in an interview and…via Kickstarter rewards. Because that’s how modern news happens, dammit! In promoting his directorial debut Hits, which recently released its first trailer, Cross decided to use Kickstarter as an avenue of self-distribution, and in doing so alluded to the upcoming Mr. Show project through a couple of the donor rewards. Wall Street Journal caught up with him and got him to clarify things on the record. Here’s how he put it. Well, I might have been a little remiss in putting that in there. But Bob [Odenkirk] and I are exploring – and we will do it – we just don’t know where or how. Something to mark the 20th anniversary of the show. Something we’ve been writing together. We got the whole staff, who hasn’t been together in a long, long time, all together. The stuff we were writing – I haven’t laughed that much in years. For hours. It was a real treat. We’re really excited about figuring out, what and how we’re going to do this thing. There’s a lot of corny, gross jokes. We’re kind of at the same place [we were 20 years ago]. But we have the same response to what goes on culturally. That’s seriously some squeal-worthy news, as the core squad of Mr. Show writers – including Odenkirk, Scott Aukerman and Brian Posehn – have all moved on to really solid careers in many different comedic sub-genres. It’ll be monumental to see what these guys have come up with after more than 15 years of the show being off the air. But it’s strange that Cross should say they aren’t sure how they’re going to do things, considering the Kickstarter rewards refer to specific times when filming will happen. So at the very least, we know it won’t be a stage show…probably, unless these are the pre-recorded parts he’s talking about. 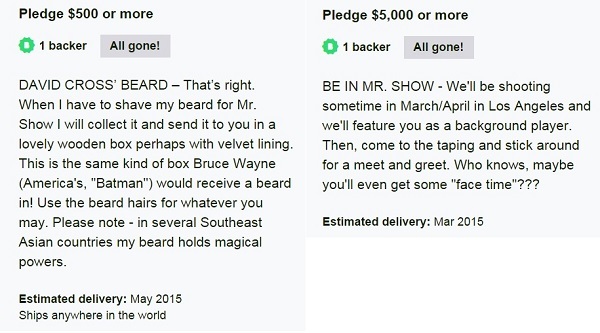 Here are the two Mr. Show-related prizes, which are already taken, for anyone hoping to land them. Sorry, detached-beard lovers. Whether it’s a limited TV show, a Netflix special, an audio play or a flip book, I’m on board with anything that falls under the Mr. Show banner. And knowing that it’s all coming together in the next few months is better than blowing up the moon.